This compilation “French Canadians in Ontario” consists of lists of the many of the churches throughout Ontario where our French Canadian ancestors migrated and explains where the document of births, marriages and deaths are located for the many parishes. This compilation is a useful tool for those who may not know exactly where these records are now located. Many can be found at BanQ, the national archives located on Viger Street in Montreal, Quebec. 1. Plug in the name of your ancestor in to the BAnQ archives directly (refer to our link for the right address): no need to know the church or village name. 2. Remember that in Quebec, women are listed under their birth family name in records, from birth to death, regardless of whether they married or not. There may ‘’wife of’’ or ‘’widow of’’ also included. 3. To make it even easier, parents are listed on marriage records. You can use the Drouin collection of books, one for men and one for women, with marriages 1760-1935, or online Drouin or Ancestry or Family Search at home or at the Quebec family History Society or at numerous other sources. Maple stars and stripes podcast is a new podcast for anglophoneswho want to do genealogical research in Quebec. Go to maplestarsandstripes.com so you can subscribe for free and also get the notes for each. I found out while listening to Lisa Louise Cook’s Genealogy Gems podcast, another great one to listen to. I even heard her talk about our Janice Hamilton’s (QFHS) blog Writing up the Ancestors Driving from Montreal to Quebec city to a fencing competition listening to podcats for 3 hours (and another 3 coming back)…my god time flies when you are listening to great ideas. Only problem is not being able to note down what comes to mind. But I definitely made sure I did not forget the Maple one. Of course, before my tournament, I just had to go to the Quebec National Archives (BAnQ) and their next dorr neighbour, La société de généalogie de Québec: great resources. Next time I’ll plan a trip all the way to Natashquan, so i can listen to so much more podcasts! En route de Montréal à Québec vers le championnat d’escrime du Québec, j’écoutais les baladodiffusions de Lisa Louise Cook, Genealogy Gems. Une peu de rattrapage pour les derniers mois. J’ai même entendu l’animatrice citer notre Janice Hamilton, à la QFHS, à propos de son blog Writing up the Ancestors. Merveilleux toutes les bonnes idées ou pistes que nous fournissent ces podcasts. Une de celles-ci: Maplestarsandstripes.com. Cette dernière est un mini mode d’emploi pour les anglophones, pour débuter des recherches généalogique au Québec. On y présente Drouin, les filles du Roy, les noms-dit, de la prononciation française… Sur le site, on peut s’abonner à la baladodiffusion de même que trouver des notes sur chacune. Quand on a les mains et les yeux occupés, rien de tel que d’écouter. Le temps passe si vite, que j’aurai pu continuer jusqu’à Natashquan! Bien sûr, j’ai fais un petit tour à la bibliothèque et archives nationales du Québec (BAnQ) avant mon tournois, ainsi qu’à la société de généalogie de Québec, la porte juste à côté. M Jacques Gagné est un chercheur en généalogie, bénévole depuis plus de dix ans à la Quebec Family History Society. Il a compilé plusieurs dizaines de listes de ressources pour les chercheurs. On en retrouve en ligne, dans la section des membres de la QFHS, certaines de ses nombreuses compilations. On en nretrouve en bibliothèque aussi à la société. Il a travaillé, entre-autres, sur les actes manquants des églises protestante du territoire que couvre le Québec contemporain pour la période 1759-1899. Il a travaillé sur maints projets, dont les églises des missions des premières nations, sur les Huguenots, tant en Europe qu’en Amérique, sur les missionnaires itinérants, sur les ressources disponibles sur les Acadiens, les Canadiens- Français et en ce moment sur les départements français. M Gagné a écrit une série de critiques de livre dont voici la première que nous vous présentons. Members of QFHS know him, and in the members only section of the QFHS you find some of his compilations. Many of his works are available at the QFHS library. He has been working hard for years to provide tools to help us look up and find genealogical information on French, Huguenots, First Nations…. Here is one of a series of book reviews he has prepared for the French Research Group at QFHS. Marcel Trudel (1917-2011) was a longtime professor at the Université Laval in Québec City and at the University of Ottawa. Recipient of many awards during his lifetime as an historian. In 1971 he was made Officer of the Order of Canada – In 2004 he was made a Grand Officer of the National Order of Québec. 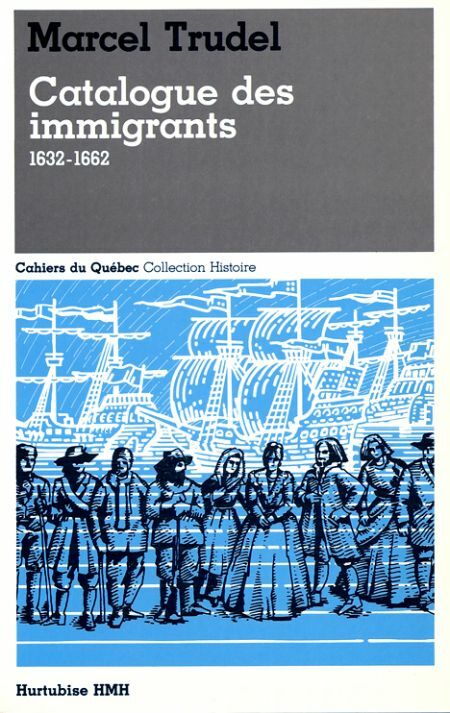 Within this 569 pages detailed research guide, Marcel Trudel has addressed 3,000 immigrants from 1632 to 1662 who had settled in Nouvelle France. Monsieur Trudel in comparison to Marcel Fournier and René Jetté has taken a different approach in his work. All three historians in my opinion are offering a different perspective to the research process of one’s ancestor in France. I have never taken the time to compare the results posted by Marcel Trudel or by René Jetté or by Marcel Fournier, but in my opinion, all three have researched and compiled superb material. Marcel Trudel as part of is excellent dictionary has spent considerable time in offering his readers, precise details such as the age of an immigrant, the type of work he or she did in France, from where they came from, were these immigrants capable of signing their names to documents such as acts of baptism, marriage, death or notarial records and what type of work they did once they settled into Nouvelle France. Les membres de la QFHS qui désirent devenir des experts en recherches d’ancêtres de France, devraient commencer par les publications à la QFHS. The Quebec Family History Society in Pointe-Claire (West Island of Montreal) has a wonderful library that is opened quite a few hours a week, and from which members from out of town may even borrow books by mail. ”Periodicals at QFHSOver the years under the leadership of Claire Lindell, Mary Plawutsky, Daphne Phillips, Bruce Henderson, Ted Granger, Diane Bissegger, the QFHS Library has been a primary repository of periodicals from the British Isles and from most provinces of Canada.To my knowledge, only the Archives nationales du Québec on Viger has a larger collection of genealogical magazines.This article will only address the aspect of research tips dealing with France. Others revues (periodicals) dealing with the French Canadians and Acadians are also stored within the shelves of the QFHS Library. QFHS members who wish of becoming experts in the research process of ancestors in France, should begin their expertise journey with the French language periodicals kept at the QFHS Library. You may approach genealogical research like you would fishing — and just to bring it back to French-Canadians — ICE-fishing (OK I wrote the ICE word, but it’s going to warm up today!). Instead of fishing with one rod, you set up as many lines as you can. The limit is how many you can check at a time… and how many holes you can dig before you are so hot you strip down to your t-shirt. 2001, Welland, Ontario: she sends on RootsWeb * a querry about my great-aunt Simone Viau-McDuff. And waits. 2011, Laval, Québec: I’m poking around the web, put in Simone’s name into Google and find her message. Wow! For sure it’s the same person, but… the message is 10 years old! No one keeps their e-mail address for that long. Too bad! Still, I send my line to the water and reply. Next day, I get a reply. Geraldine, daughter of my grandfather’s cousin, was jumping up and down in her living room when she got my message (just like I was when I got hers). Like many Quebecers during the 20th century, her grandfather Philias Viau , had moved from Lachine to work in the Niagara region around 1904. He was my great-grandfather J. Francis Viau’s brother. They lost their French, but there are still some Wellanders that don’t speak English. The Welland canal was of great importance as a link between Lakes Erie and Ontario. Many industries flourished along the canal, like The Electro Metallurgical Company unit of Union Carbide where Philias worked. I went to visit Geraldine by train, learned about the region, met some great people. Among them, Renée Tetrault, a founding member of the Welland Branch of the Franco Ontarien Society of History and Genealogy now known as the Réseau du patrimoine franco-ontarien. Renée has served for more than thirty years as the expert who assists researchers at their Centre for Research in the Welland Public Library. She will describe the extensive holdings of their library in and offer suggestions for researching in Quebec. Which leads me to introduce this French-Canadian resource: there are six regional centers in Ontario. Three times a year they publish Le Chainon (paper or digital). They have quite a few online resources (Ontario and other provinces including Quebec, and even American parishes) available to members, among which transcribed notarial records, BMS, cemetaries, family histories, cities and towns, census, archive guides, and a lot more. When part of a family moves away, news and pictures are exchanged to keep in touch. 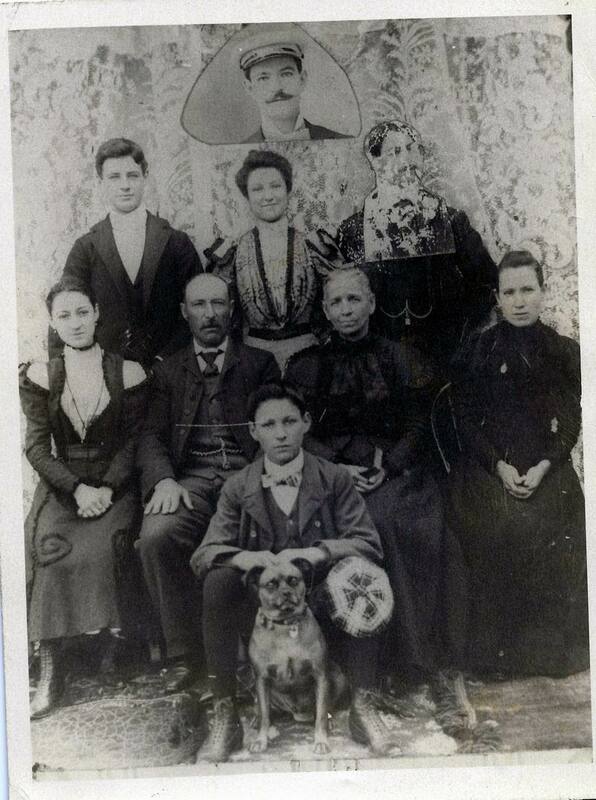 Geraldine had pictures of my Montreal family that I had never seen and letters writen by my direct ancestors. The jewel: a cash book kept when Philias’ father Onesime Viau died in Lachine, where all spendings (lots of prayers in church) and income (rents) were described along with after-death inventory and each child’s share of inheritance. The two of us were able to piece together family stories that individually we couldn’t figure out and dentify people on each other’s pictures. Finding cousins will help you go up your tree in surprising ways. The other, send a lot of lines out, keep a log, follow up, but be patient. Be courteous, some will never bite, some are not interested. But dream big, don’t be stopped by logic and expect anything…fish come in many shapes and sizes, and even as messages in bottles. * Rootsweb was one of the first online free cooperative genealogical resources. Ancestry has picked it up, but we can still go into archives or free. Hiding to read that kind of newspaper? Readers always loved those stories, but…they would rather not admit it. 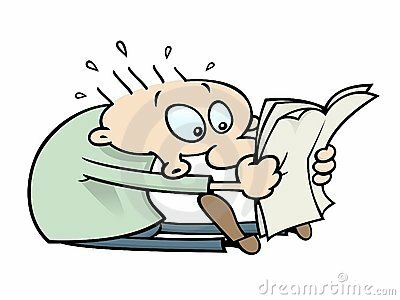 Vicky Lapointe, graduate historian from Sherbrooke University, signs a special newspaper blog. She combs through Quebec old newspapers to present us with crimes and catastrophies, francophones from outside Quebec and some pictures, medicine, history and patrimonial buildings. It is suprising to see what kind of news would make the paper a century or two ago, how people responded, and yes…what strange crimes were being commited. I also enjoy reading about events that are now part of history, as they happened.